Ken Kurtz is an animal-dental-care technician who lives in Newport Beach, Calif., and travels around the country putting his hands in the mouths of huge dogs. Twenty years ago, Kurtz developed a seven-step dental-cleaning procedure for pets that doesn’t require anesthesia (AnimalDentalCare.info). He started practicing in Utah in November 2011. City Weekly met with Kurtz at Sugar House Veterinary Hospital to talk about why pets need dental work. Why are people willing to spend so much money on their pets? Pets have now become parts of people’s families. Pets are more up in people’s face, and if they have a nasty mouth, you’re going to know. They sleep with them, they’re treated like kids and people want to take care of them. I have eight pets of my own, and I couldn’t think of not doing everything I could for them—just as much as if I had a child. They become family members, and they count on us for everything. What can happen to a pet if their teeth are never cleaned? They can have a lot of problems with their heart, their kidneys, a lot of systemic problems. Think of it as constantly ingesting bacteria. When you go to the dentist, it’s minimal calculus built up on your teeth, but dogs and cats seem to develop a lot more. We take off chunks that are a millimeter thick and covering the whole crown of the tooth. With them constantly ingesting that bacteria, it’s really bad for them. How is your procedure better than anesthesia? There are quite a few animals that can’t take sedation because of heart problems, kidney problems, whatever. It’s really nice to be able to get in there and work on some of these older geriatric clients, clean the teeth and help them feel healthy again. A lot of people are a little reluctant to do anesthesia for their pets, because they can’t afford the anesthesia or they don’t want to do it. They’re going to be able to come in more often and take better care of their pet. There’s a lot of time when an older patient does need that anesthetic procedure one time, and after that we’ll be able to maintain their teeth. They actually have a reason to do the anesthesia because there’s hope down the road that they won’t need it. 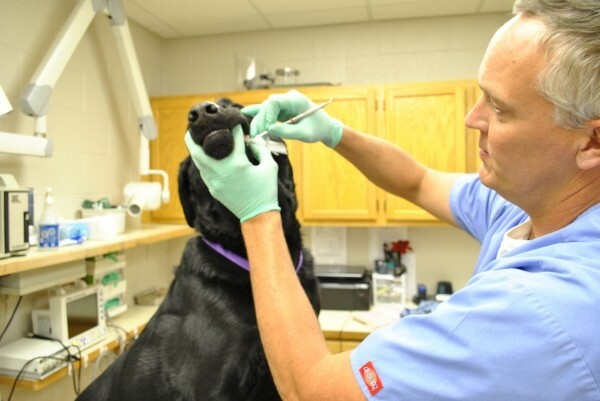 Most dogs come every three to five years to have their teeth cleaned. Most dogs will start developing plaque and calculus right after a cleaning. If you were going to do it every year, that’s a lot of anesthesia for a pet that’s going to live 14 years, and be under anesthesia 14 times. So is this a lot cheaper than normal dental work? They don’t have to pay for the anesthesia, and that’s a significant cost. They also don’t have to have the blood work and it takes less time. But some of your smaller toy breeds need to come in more often, because they’re on a soft diet. And if there is any pathology—deep pocketing, broken teeth—those types of things need to be addressed under anesthesia. What’s your secret to getting dogs to trust you—are you a dog whisperer? You just have to be kind to them. If you’re really gentle, work one tooth at a time and be aware of their nervousness. After doing it for 20 years, a lot of it just comes natural—you can kind of predict what they’re going to do. It’s all a matter of a gentle touch. We don’t squeeze them. Talking to them really helps a lot. I kid you not, when I get done with these animals, they’ll start running up and down, rubbing their face on the ground—they’re excited. It just feels good to have your teeth cleaned. It takes me about six months to a year to train my technicians. They go through a curve where they’re so frustrated that they can’t work on the dog, and so we take it from them and put them on another one, and another one, and then suddenly, it’s like night and day—they’re like, “Ah, I get it!” and they become efficient at it and get really good at it. I bet cats are just impossible to do this on, right? Actually, I prefer working with cats any day of the week. They’re definitely a lot easier to work on. One, it’s less tooth surface. The largest tooth in a dog’s mouth has more enamel on it than all the teeth in a cat’s mouth.